We went to the dance studio where Namine takes ballet and jazz early. There was a meeting on the upcoming recital, and we didn’t want to miss it. The meeting ran long, so Namine and I had to duck out to get her to her class on time. We did get to see the costumes for this year’s recital before we left, though. The ballet class doesn’t have a dance at this recital, only jazz. Most of the class was the same as they have been lately — practicing different moves. But near the end of the class, the teacher started to in introduce the kids to their song for the recital, which will be in June. The teacher assigned places for each student in the dance, and will begin the step-by-step process of the dance steps. Namine and I have a little bit of extra work cut out for us. Last time Namine was in dance — nearly three years ago — for the most part she stayed in her wheelchair, with a little scooting on the floor for good measure. But this year, prior to starting dance, Namine told me that she wanted to do it in her walker. She has kept to this with admirable determination. The dance Namine will be doing for her recital has a fair amount of hand waving ( Jazz Hands! ), but she also needs the use of her hands to stand in her walker. 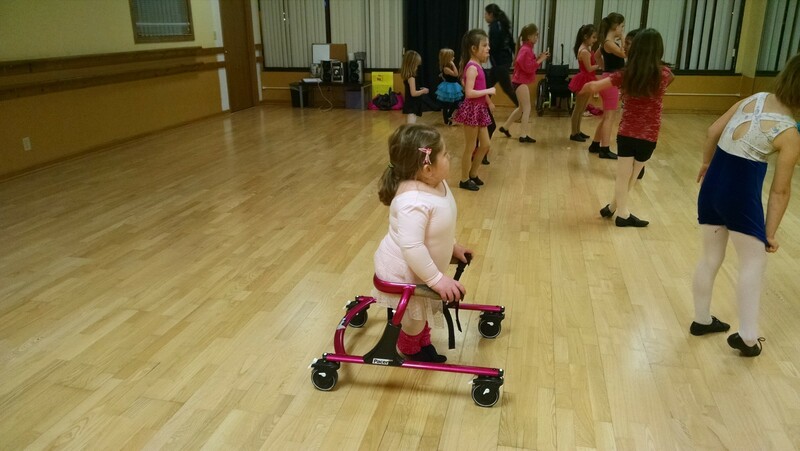 Thanks to the seat attached to her walker, she can sit down and stand up pretty quickly, so we’ll have to figure out the best way to get the most out of the dance — when to sit down and do the arm motions, when to stand up and dance. It’s going to be fun!